The reigning Heisman Trophy winner wanted to be out on the field so badly that he warmed up in full pads prior to Saturday’s primetime game against Clemson on ABC. A bothered Florida State head coach Jimbo Fisher talked to his suspended quarterback, who had taken snaps in the pregame ritual. Shortly thereafter, Winston returned to the locker room. When he reappeared on the Florida State sideline, Winston did so sans pads but still wearing his game jersey. The sophomore initially received a first-half suspension for acting, well, sophomorically. Earlier in the week, he shouted atop a table in Florida State’s student union a vulgar catchphrase that includes another word for a cat prefaced by a word that begins with “F.” The school subsequently upped the suspension to the full game after bad publicity followed the initial punishment. Florida State administrators claimed the on-second-thought suspension resulted not from the criticism of the school but because Winston initially had not been fully truthful, which may or may not have been fully truthful on their part. The talented quarterback’s run-in with Florida State discipline this week follows run-ins with State of Florida discipline. 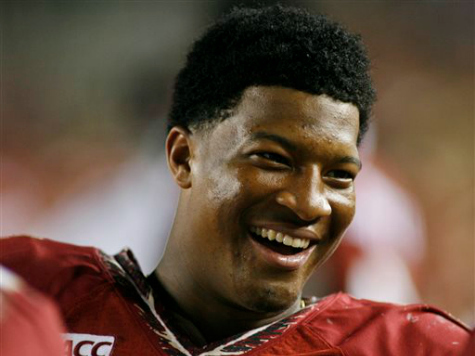 Winston received a citation for shoplifting crab legs in April and served as the subject of a sexual assault allegation last year. In December, a state attorney declined to prosecute the star quarterback. The next month, he led the Seminoles to a dramatic national championship victory over Auburn.